Plastic radial ball bearings are used in semiconductor processing equipment because they can operate in hostile chemicals which are required in the manufacturing and processing of silicon wafer materials. The bearings are designed to be maintenance free and operate without lubrication allowing them to be non-contaminating to the environment in which they are used. KMS Plastic race ball bearings made from Kynar® or PEEK engineered polymers have proven to improve the performance and life expectancy in challenging environments over conventional steel bearings while providing a substantial cost savings from reduced downtime. Critical Design features: Kynar® (PVDF) or PEEK plastic races fitted with either 316 stainless, borosilicate glass or ceramic balls. Features a single or double row True Race Technology™ ball groove construction for optimum load, speed and durability. High Heat Capability: KMS bearings made from either PEEK or Kynar® have higher heat capability (180°F to 450°F) over conventional POM plastic or steel bearings without the need for lubrication. 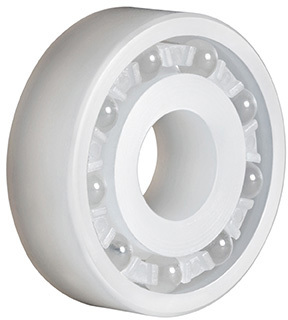 Less Friction: Engineered polymer races fitted with either 316 stainless, glass or ceramic balls naturally have less friction than metal to metal steel race bearings.